These days take place once a fortnight on a rolling programme. Many lessons are delivered by specialist teachers, external agencies and tutors, ensuring high quality delivery. We use the most up to date and accurate information in the key focus areas such as health and wellbeing, living in the wider world and economic well being. One tutor period a week is designated to ensuring that all students learn about the personal skills and qualities required in the modern world and keep students well informed about their future options when leaving school. The school employs a careers advisor who provides information, advice and guidance to all students. ‘The Big Question’ enables students to reflect on and discuss a range of spiritual, moral, social, and ethical questions using Philosophy for Children (P4C) techniques. A range of visual stimuli and prompts will ensure students have appropriate scaffolding to engage in meaningful discussion around these issues. This contributes to all round spiritual, moral social and cultural education (SMSC) and also contributes to students thinking skills. This is a weekly session that aims to deepen students’ cultural awareness. One tutor session a week is dedicated to this and supplemented through reference in assembly. Eg. This week you will be discussing……. The Curriculum will cover: the arts, national and international politics, significant figures from national and international history. The content is sourced from the BBC and other recognised news sources. Assemblies are an essential part of creating the ethos and smooth running of the Academy and set the tone within school. As such the assemblies align with SMSC, PD and PSCHE under the RESPECT curriculum. They are delivered by members of the SLT, Progress leaders and external speakers. Assemblies are used to celebrate success, raise awareness of the importance of the Characteristics of Greatness framework (COGs) and to inform students of Key dates in the calendar such as Black History month. At Beamont Collegiate Academy we are keen to ensure that every student leaves us at the end of year 11 fully prepared for life in modern Britain. As such, we have created a framework for assisting students in achieving their goals and potential. The framework is based around the essential personal development skills and attributes that all students require when moving from school, into further education and then onto higher education or into employment or training. 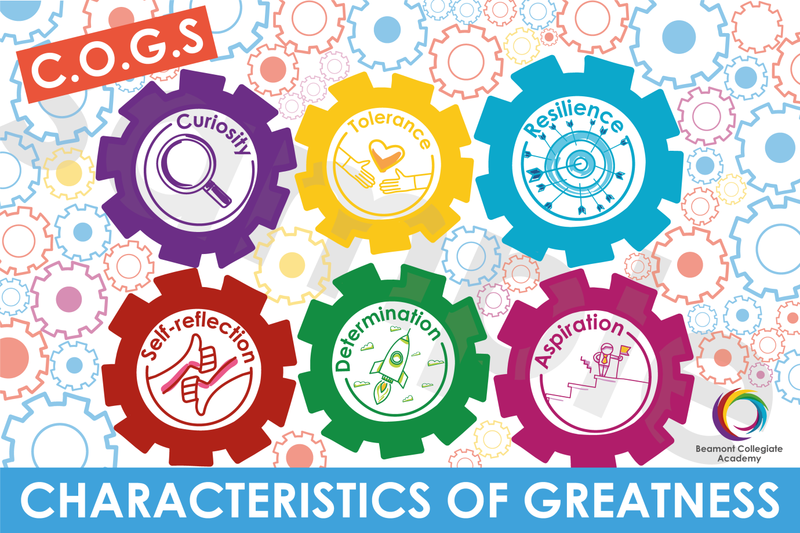 Students are encouraged to demonstrate the attributes and skills indicated on the graphic below and are awarded stickers and COGS ties to recognise their achievements.